La Puerta, your Real Estate partner. Contemporary Placitas is a reflection of La Puerta itself. When it's time to shop for a home or vacant land for your dream home in Placitas, La Puerta has the expertise and neighborhood networking skills to make your search fruitful and enjoyable from the first day out. We won't waste your time showing homes that have no application to your requirements. And when your choice has been made, we will skillfully represent you in negotiations with the seller. We will assist you in the search for favorable financing. When the time comes to list your home, we understand that you have many choices. But when you consider all the aspects--from knowledge of the area to marketing expertise and "track record"--there really is only one logical choice: the Placitas experts at La Puerta Real Estate Services, LLC. No one knows Placitas like we do: La Puerta has roots deep in the community. We are the source for all subdivision maps, water reports and our office houses the Placitas Chamber of Commerce. Exposure: From the initial open house to the day-to-day servicing of your listing, to gathering at the closing table, nobody handles your business with quite the care, depth and enthusiasm of La Puerta. But don't just take our word for it. Ask your neighbors. Chances are, they have had experience with La Puerta (or Placitas Land and Homes in the past). We stand by our reputation. Accessibility: La Puerta is literally the gateway upon entering Placitas. Our office at 01 Ridge Court is visible to all motorists, so we get lots of drive-by traffic resulting in a huge walk-In business rare for a real estate company. A high percentage of these first-time visitors are actually considering relocating to Placitas, and La Puerta is ready for them. Clearly, this is where your listing belongs. "CMA." Real-estate shorthand for "comparative market analysis." An accurate CMA helps you establish the best asking price to encourage a timely offer. It stands to reason that the most experienced Placitas Realtors are the most qualified to perform highly accurate market analyses. Their knowledge and expertise of the marketplace enable homeowners to correctly price their homes. Quite often they will have listed or sold the "comps" that form the backbone of your CMA. Custom marketing. La Puerta will produce and distribute a photo flyer for your listing. We are the only Placitas-area Realtors who hold comprehensive MLS open houses on a regular basis. We invite all Albuquerque-area Realtors (invitations are distributed through the MLS to about 2,000 area agents) to a Placitas home tour. It's just one aspect of networking, and La Puerta is dialed into every opportunity for resale marketing in the greater Albuquerque and Sante Fe areas and the Santa Fe area. A marketing department has been created to market your property in the Homes Magazine and Sandoval Signpost. Additionally, we distribute marketing materials to local businesses. Marketing liaison visits are also made to Santa Fe weekly to help market our area. Not all brokers are created equal. At La Puerta, we make sure your property is being listed in the local MLS and through social networking sites such as twitter and facebook. 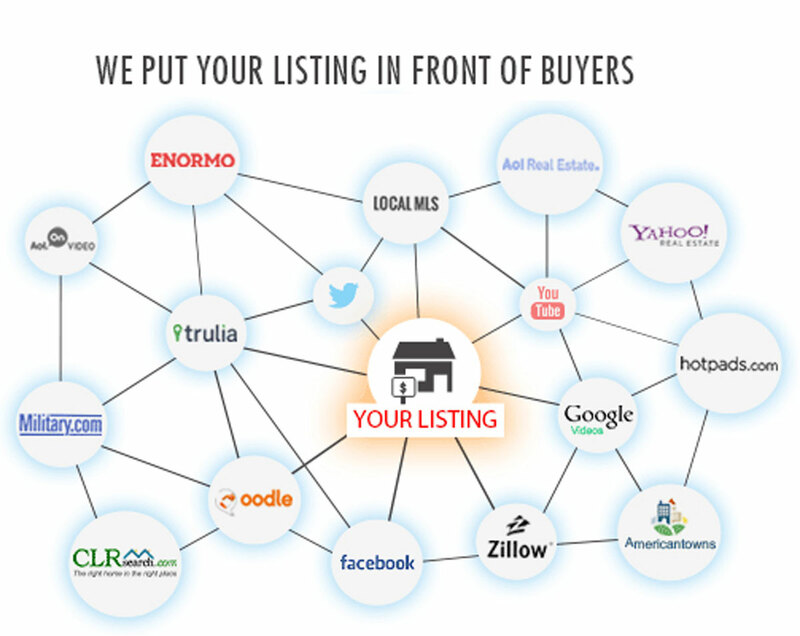 We also use mega listing sites such as Zillow, Trulia, Google Maps and Videos, and Youtube. This will make sure your property reaches far and wide. If you have chosen to purchase a lot on which to have a custom home built, we stand ready to recommend a number of fine area builders. For our roster of preferred Placitas builders, please contact us.